Well, Well, Well . . . I CAN actually sew. I made a really nice apron. What I make has to be simple and not have to fitted. My confidence has soared to the moon! I found out I can . . . .
Do a wonderful job topstitching. Make perfect bias tape. I don’t know who would make bias tape by hand except me. I mean, well, it only took me around two hours. But I figured it would have taken me that long to get in the car, go to JoAnn’s or Hancock’s, and buy a bias tape maker. And you can’t go shopping there without your 50% off coupons so I would have spend time looking in my big sewing mess for that too! 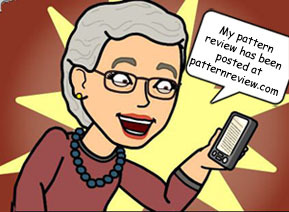 Follow a pattern perfectly even if the center pocket is ugly and too big. Maybe following the pattern perfectly is not so good sometimes??? Wow! I did no fitting adjustments and the apron fits. What a wonderful feeling. Perhaps I should make a few more aprons before I go back to trying to make something to wear. I just don’t think wearing only the apron will cut it! 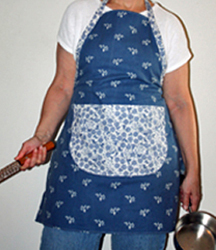 Pattern Description: From the envelope back MISSES APRONS: This apron package includes instructions and pattern pieces for making eight aprons in several styles and lengths. Yes, although I did use different fabric colors. This pattern wastes an incredible amount of fabric when you lay out the pattern piece for the bias tape trim. I think if I ever make it again, I will figure out some other way to cut the bias tape. You can barely see the seams in my fabric so I think I could have used smaller pieces and sewn them together. I bought the fabric at Hancock’s. The blue fabric was on their upholstery remnant table and the flowery fabric is some kind of cotton with polyester from their quilting area. Making sure the fabric was on grain was tedious as I had to trace the fabric lines by pulling the thread and then cut on the that line. The fabric was really cut poorly so I was glad I did that. Thank goodness for rotary cutters! Pattern alterations or any design changes you made: I didn’t make any design changes except using a different pocket on the view I made. If I do make the apron again, I am going to make the pocket smaller. It is just too big. I may add some vertical stitching on the pocket on the finished apron to divide the pocket into three sections. Would you sew it again? Would you recommend it to others? I don’t know if I will sew it again. I don’t need another apron yet. Eventually, I may make one or two for gifts. Conclusion: I truly enjoyed making this apron. I have not been happy with the garments I have made so far so I thought I would try something different. 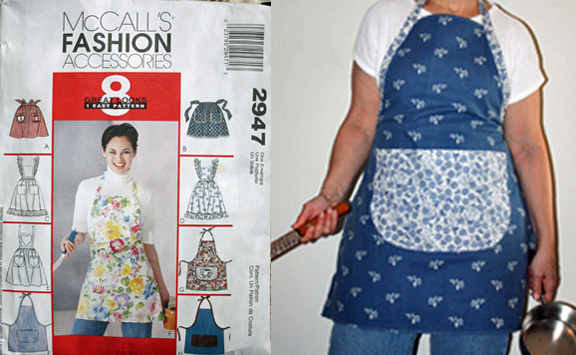 I could just sew the apron and didn’t have to worry about fitting. It was the first thing I have made, since I started sewing, that I actually picked out fabric for. Everything else I have made (muslins) so far has come out of my estate sale score. It was fun sewing something I picked out the fabric for! Making this apron really helped build my self-confidence. And I think I did an almost perfect job! My top stitching on the apron is nearly perfect. I hope I can do that again on other garments/crafts. When I stopped at the local dealership to buy the ankle foot for my machine, on a whim I also bought a “Thingamajig” made by Dritz. It was just such a pretty red color! (Who says marketers don’t know how to use color!) I had just read about it somewhere on the web and decided to give it a try. I used “Thingamajig” when I topstitched where the seams met and were very thick. What a neat thing! I didn’t have any trouble topstitching around corners! The topstitching looked great! I know I will be using it a lot! I also learned how important it is to use a sharp needle and the correct size needle. I put a brand new needle in right before I began topstitching and I couldn’t believe what a difference it made.